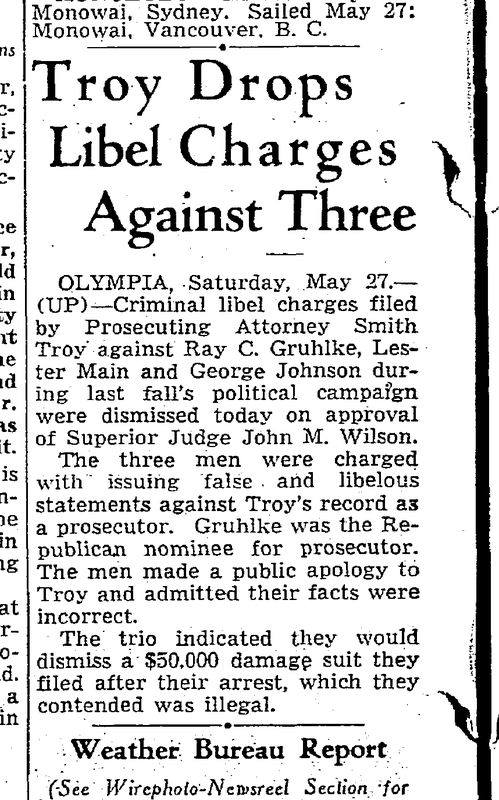 Smith Troy, the 1930s era Thurston County prosecutor, is one of the most fascinating historic figures, must have had brass balls. Seriously, he could not have lacked for guts. I'd certainly not argue that he was always on the angel side of things. But, when he acted, he seemed to act with no consideration of alternatives. Full forward. Sure, Gruhlke might have stretched the truth. But, it is hardly a lie to say the prosecutor should have arrested more prostitutes. And, no matter how he phrased it, that is pretty much all that Gruhlke said. 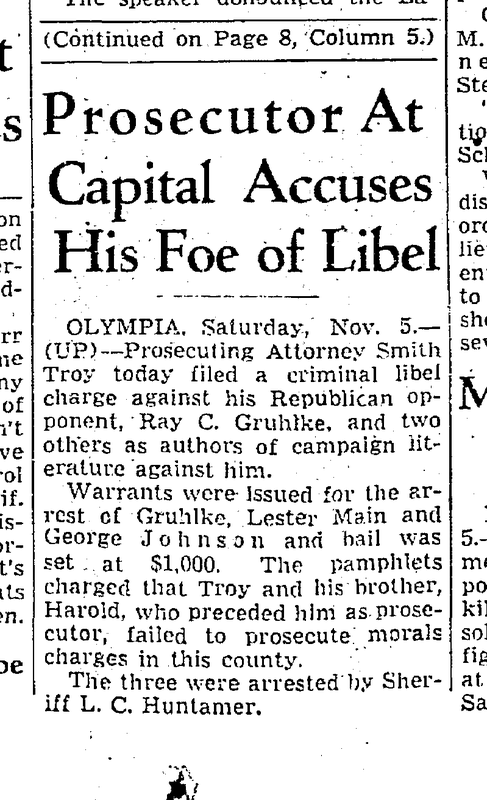 And, even if Gruhlke said "I know for a fact that Troy decided not to arrest women of the night!" it is a strange image of a prosecutor running for office arresting his opponent. But, then months later, after Smith won another term, the parties kissed and made up. Smith was only just over a year away from being appointed state Attorney General. He had just prosecuted a high profile attempted murder case and he had empanelled a grand jury looking into misuse of state funds. And, he arrested someone for campaigning against him. And, in the end, he got an apology from the man he arrested.